For those of you who like salt please take a moment to swallow a 50lbs bag of it. Coming out of the blue is a claim by the YouTube channel “That Hashtag Show” of a list of returning Power Rangers to Power Rangers Super Ninja Steel airing in 2018. 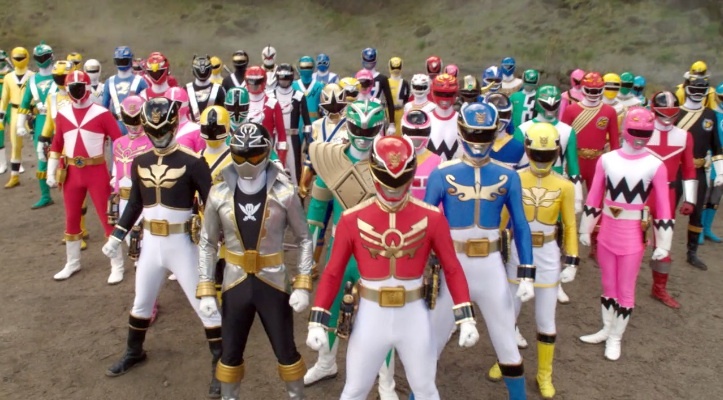 Included in this claim is that many of these returning Power Rangers are around for more than a single episode, and that some have focus episodes (akin to the Jungle Fury episode of Power Rangers Super Megaforce). Again – this is information released by That Hashtag Show (whom have ties with MMPR Toys, Power Morphicon, etc.). However, with the slip of the tongue by the Ninja Steel Red Ranger earlier this year stating that previous Power Rangers were returning for Super Ninja Steel, this may shed some light on what we can expect for the 25th anniversary of Power Rangers. For the video and the list of supposed returning Power Rangers from That Hashtag Show, please click “Read More”. Details on the possible returning Power Rangers begins at 01:05:11, and drops casually until the end of the video. Join in our conversation on our forums below! Rumor has been out for awhile, but That Hashtag Show has leaked the list. Again, this is a rumor (we cannot confirm), so we will let them speak it. JDF isn't a surprise, but I'm glad we're getting Pua Magasiva and Sally Martin. Shame Glenn McMillan isn't coming back to round out the trio. I wish we also could've gotten David Bacon just to fully recreate the Ninja Red and Hurricane Red scene, but you can't always win. Honestly though, this returning roster actually has me interested. Always great to see returning rangers, especially ones we don't usually get to see. Keep in mind that we don't have any verification that this is real. Not that I doubt That Hashtag Show's crew (knowing their connections and relationships), but it's surprising that they would choose to randomly release all this information on a random video. But they seem pretty certain and I doubt they'd put their reputation on the line for clickbait. No Alien Rangers? That's disappointing. Hopefully the MMPR rangers wear the ninja outfits. Sorry for being the downer, but this doesn't interest me at all. I don't have much hope after the Legendary Battle episode of Super MegaForce. They got several great actors for that, and each one got maybe a single line of dialog. I'm glad to see previous rangers returning, but I'm not going to hold my breath hoping for a Forever Red type of episode. Especially seeing how the info isn't even mentioned in the title or thumbnail of their video, so it's not exactly effective clickbait. That is what's most convincing about this to me. I'm still remaining skeptical, but I'm REALLY hoping this is real. I don't have any hope in this after what happen with super megaforce and the super dinocharge last ep this sound like another boatload of crap. Just leave the show the way it is stop screwing with it, it bad enough there no more back story with these shows.